via The Nation, 27 September 2018: This talk happened just before IPPA last week. On the occasion of the 185th Anniversary of Diplomatic Relations between Thailand and the United States, the Department of American and South Pacific Affairs, Ministry of Foreign Affairs of the Kingdom of Thailand, the Ban Chiang National Museum of the Department of Fine Arts, and the Department of Archaeology, Silpakorn University, in collaboration with the Institute for Southeast Asian Archaeology (ISEAA), the United States of America, will organise activities to further promote Thai – US cooperation on the archaeology of Ban Chiang in Bangkok and UdonThani Province during 19 – 21 September 2018. Representatives from relevant government agencies, academics, students, professionals from tourism industry, media, and the general public are expected to attend. A study and resource centre will be set up in Ban Chiang, in Thailand, one of Southeast Asia’s most important bronze age sites known for its distinctive red painted pottery. The cradle of Bronze Age culture of Southeast Asia is one of the region’s lesser-known, up-and-coming tourist spots. Udon Thani in Northeast Thailand is the gateway to Ban Chiang, where the earliest evidence for bronze was found in the region. 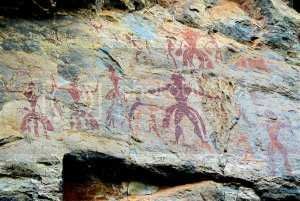 The Shumla (Studying Human Use of Materials, Land, and Art), a centre for rock art research based in Texas, recently made a trip to Thailand to see some of the rock art there. Rock art is one of the least understood pieces of material culture in Southeast Asia, and in this region is given a cursory, by-the-way mention in texts. Rock art in Thailand is clustered around the northeast and along the peninsula.